In The IoT Space... Who's On First? All of the traditional categories of platform developers (IT systems, telecom systems, and automation and control systems) have historically operated within well-established technical development protocols and business models that reflected the distinctive competencies that each group has developed over the last 20+ years. The advent of Smart Systems and Services and the increasing presence of new [non-traditional] software players is causing a blurring between these legacy business models, particularly in platform development, forcing most major suppliers to re-think their strategies. Too many people today take it on faith that the best possible designs for the future of connected sensors, machines, people, systems and information will emerge from large IT, Telco or similar players. Yet, in the course of the last two decades, the world has become so dependent upon the existing ways computing is organized that most people, inside IT and out, cannot bring themselves to think about it with any critical detachment. The telecom, IT and automation and control sectors have failed to re-evaluate their relationship to advancing technology and to their constituents. The business and technology paradigms to which these industries cling today are far too limiting, too cumbersome and too expensive to foster and sustain digital innovation and new growth. From a Telco perspective, today’s discussions of IoT systems and platforms focus almost exclusively on communications – the “pipe” — and very little on the data and information value. From an IT perspective, today’s corporate IT function is a direct descendant of mainframe and client server computing architecture and works on the same “batched” computing model – an archival model, yielding a historian’s perspective. Information about events is collected, stored, queried, analyzed, and reported upon. But all after the fact. Both the telco and IT technical development communities have taken very different approaches with very different architectures from the automation and controls community. The automation and control technical development community is obsessed with control and knows little about how to manage and leverage data, but the IT and Telco communities really do not understand how to integrate and utilize real time deterministic sensors, actuators and machines. All these traditional development communities are vying for leadership in developing and deploying a new generation of digital and IoT platforms and yet all three groups are still embracing models of information, networking, and data management that were conceived long ago and cannot serve the needs of a truly connected world. Data today is locked in silos, on both a system-by-system basis and by vertical use. Software development is duplicated and applications remain unable to share data or functionality. We are using the last generation of tools for the next generation of computing and information interactions. So, who exactly should businesses be turning to for the next generation of integration and platform technology for Smart Systems and Services? Who’s really on “first base” with this challenge? After displaying signs of relative indifference for so many years, traditional IT systems, enterprise software, telecom and network equipment players have finally awakened over the last few years. 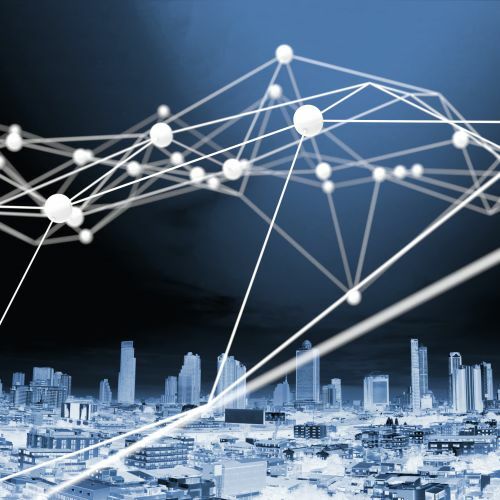 Meanwhile, the world of Smart Systems and Services has continued to evolve, particularly in the emergent software player communities serving this opportunity. In this new cycle, physical assets and devices are being connected and enabled with sensors on a daily basis. Recognizing this scenario, technology suppliers around the world are now devoting major resources to addressing the opportunities associated with Smart Systems, but are, for the most part, failing to bring any new fundamental innovations to market. For most IT and telco equipment vendors, selling existing servers, switches, PCs, storage devices, and enterprise applications will be a recipe for shrinking revenues, given the impacts of new architectures on these markets and applications. But demand for these purchased technologies will not disappear. A few vendors that focus on being the “consolidators” of these shrinking but still large product markets will be able to survive. The functional requirements for new digital and IoT platforms increases with the complexity of the use cases as well as the scope of assets to be targeted; the IoT is not a simple environment to navigate. High value use cases enabling widespread visibility and collaboration can be achieved using today’s technology however, significant time and money is required to integrate and manage the diverse tools from numerous vendors. Who will be the winners and who will lose as the Smart Systems Platform opportunity develops? In the much larger and more complex world of business-to-business technology, there is no vendor that has the clear leadership position. While the “Internet of Things” platform opportunity represents a market of vast potential, technology suppliers must be aware of the current technical and competitive dynamics if they are to successfully navigate the market. 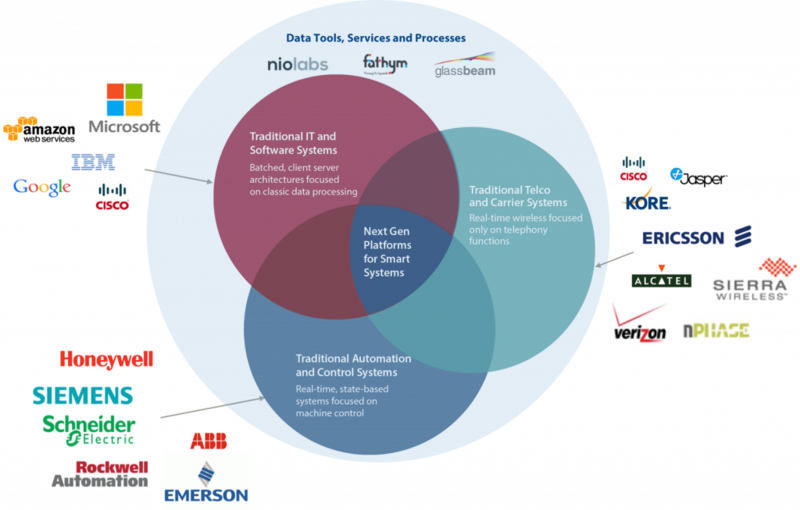 How well will various supplier groups align with the Smart Systems opportunity as it develops? Let’s start with the silicon players. Players like Intel and Qualcomm all understand the implications of distributed computing and embedded intelligence, they just can’t seem to get out of their own way which is leading to a new round of acquisitions and development work that seems almost like a “scatter diagram” of maneuvers across the market landscape. ARM is still in the lead, based on its natural evolution and business model, but all of the silicon players need to be thinking about silicon’s relationship to new data services and applications they could be doing more to enable. Players like HPE, Dell/EMC, Lenovo and other peer legacy IT systems players are all still in the horizontal IT tech space and have been slow to embrace Smart Systems in a meaningful manner beyond “point” maneuvers such as gateways. Carriers like Verizon and AT&T have constructed the largest real-time networks on earth and yet they do not understand the diversity of sensors, devices and machines and the valuable role data from these things plays in creating new value beyond the communications pipes – this is a group that only understands how to integrate two classes of devices, cell phones and smart phones. 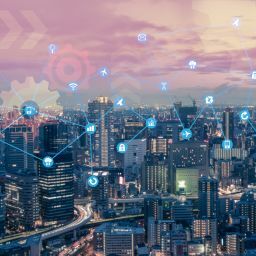 Given their lack of innovation and inability to move quickly, it’s easy to assume they will continue to focus on what makes them money today and avoid really grappling with the challenges of IoT systems. IBM should have a leading position but needs to overcome its professional services bias, improve edge capabilities and drive value from the myriad of software acquisitions they have made. But it seems clear that driving its Watson strategy to a meaningful and functioning capability beyond what the consulting organization can deliver with it has become a difficult hurdle. SAP is trying to get unstuck in many ways. Like Oracle, SAP has both the apps and the analytics capabilities to put into Smart Systems solutions. However, its platform story lags behind Amazon’s and Microsoft’s. SAP, of course, understands that balance sheet issues do matter, and its product suite can be, and has been, used to address these issues in some industries. Amazon has come out of the backfield and become a significant force in modern information and computing systems. Its maneuvers to create a significant ecosystem of partners coupled with focused “specialist” IoT acquisitions have positioned the company to be a formidable competitor for infrastructure. With its recent announcements, Amazon is driving further to the edge by providing a RTOS, device management, and edge-based analytics all signs that the company understands what future computing might need to provide for IoT systems. In many ways, Microsoft has been the clever player leveraging its legacy strengths from critical horizontal enterprise technologies in infrastructure with its shift to Azure. Coupled with its re-structuring into vertical solution delivery business segments, Microsoft has positioned itself into an enviable position. But, in the end, it would appear that all of the new generation of IT cloud services and infrastructure players are in a mad race to commoditization unless they move beyond just infrastructure. Although the overall growth opportunities and future use cases for 3D printers are well defined, the timing of their adoption is very dependent on technological development and remains relatively uncertain. Regardless of where and when 3D printers get deployed within the manufacturing sector, value creation will largely reside in the data that is created and captured. Smart Systems Platforms With Real Data Management Capabilities Are Fundamental to Success. With more players focusing on the Smart Systems opportunity the competition for customers is heating up. New entrants are quickly realizing that in order to be profitable it will be necessary to connect large volumes of devices to scale revenue opportunities and, as a result, seeking new ways to differentiate their services beyond simple device enablement and connectivity services. Beyond this, enabling complex use cases requires advanced data management, integration and collaboration tools as well as machine learning-enabled analytics. Alliances Are Key to Success.The dynamics surrounding the Smart Systems and Services are incredibly complex. Basic enablement, network connectivity, device and machine integration into platforms and providing new services, value-added applications, and other device management functions are all needs that generally must be addressed when customers seek to connect intelligent machines and devices. Given all of the aspects that must be addressed from the customer standpoint, alliances represent the best available means to address the challenges facing an OEM or the end customer and also create maximum value for all parties involved. Systems Integration. Ability to pull together the hardware, software, and network elements of Smart Systems. These solutions will not work if they are a collection of separate hardware, software, and network products from different vendors unless, and until, there are clear standards and protocols that define how each part works with the others. Those standards and protocols for interoperability, security, and performance will mature in time. But, for now, vendors that can provide all the elements of a full solution, and can do so as a product that can be sold to many clients, will have the edge. Managing the Contention Between Horizontal and Vertical Opportunities. In this evolving arena, despite what observers say about the “vertical intensity” of application solutions, horizontal core technologies will make up the bulk of purchases. Technology suppliers looking to be the players with dominant shares and scale economies from horizontal technologies will need to manage the “creative contention” this will create with vertical solution deployment and delivery. This requires new technology innovations and new relationships between and among large players and small specialist players serving new vertical niches. All participants will need to carefully pick the horizontal technologies that they want to master and/or the verticals that they want to dominate and give up the others. Sadly, this does not appear to be the current state of affairs in the collective digital and IoT arena, particularly as it relates to next generation platform development. Witness the number and diversity of misguided platform acquisitions over the last few years. Larger IT and equipment manufacturers acquiring platform players with a diverse range of intended business models that, for the most part, do not align themselves will with their new parent company’s strategic intent. GETTING THERE FIRST; BUT TO WHERE? Though the IT, Telco and Automation player business models are intermingling today, no one would characterize the existing players in any of these groups of being technology or business model innovators or disruptive in nature. What’s required is a radical departure from current offerings, development protocols and business practices. So, from our perspective, it stands to reason that since these types of solutions do not fall within the scope of the experiences and capabilities of the existing supplier groups then virtually none of them are on “first” after all.